Sundance darling and Jarmusch acolyte Tom DiCillo’s career trajectory has been riveting to behold. The director who set the indie world on fire in the early ‘90s with ‘Johnny Suede’ and ‘Living in Oblivion’ fell with equal rapidity after the humbling disaster that was 2001’s ‘Double Whammy’, which was hauled over the coals by the critics and failed to gain a theatrical release. His is an irksomely erratic and wilfully individual oeuvre. Both of these films find DiCillo following up these creative peaks and troughs. Arthouse veterans John Turturro, Catherine Keener and Sam Rockwell star in DiCillo’s third film. Al Fountain (Turturro) is an officious, detached electrical engineer from suburban Chicago who travels to a rural backwater for work. When his job is cancelled, he uses the opportunity to take some time away from his wife and child and visit the lake he briefly visited in his youth, which is the best memory he has of his unhappy childhood. Fountain begins to suffer from hallucinations where he sees things around him moving backwards. The trip brings him into contact with The Kid (Sam Rockwell), a playful, scatterbrained, credulous young man striving for self-sufficiency who teaches him not to take life so seriously and enjoy himself. ‘Box of Moon Light’ was initially intended to be DiCillo’s follow-up to ‘Johnny Suede’, but when funding fell through he decided to make ‘Living in Oblivion’ instead. As is so often the case, the stopgap ended up being superior to the labour of love. But that’s not to say that ‘Box of Moon Light’ isn’t a stylishly presented piece of film-making, with its languorous pacing, slow pans and tracks and shimmering photography providing a perfect distillation of the sultry backdrop. The soundtrack is also effective in adding a folksy flavour to proceedings, with banjos, harmonica and tremulous guitars. Turturro is in his element early on as the ill-at-ease boss struggling to engage with his employees and simmering with rage and frustration, but he fails to convince as the likeable, laid-back character Al is supposed to transform into. Turturro does conniving, creepy and intense with aplomb, but he’s no Jimmy Stewart. Rockwell is particularly grating as the slow-witted yokel who fancies himself as part survivalist, part shaman. At this point in his career, Rockwell was in danger of becoming an Owen Wilson-esque drawling slacker buffoon in a string of undistinguished supporting roles. Thankfully, he made some good choices and became one of the finest actors of his generation. Turturro and Rockwell quickly ease into ‘fish out of water’ mode; the overburdened city slicker who overcomes his initial discomfort to throw off the trappings of his hermetic white collar existence and the noble savage who teaches him to appreciate the simple things. It’s a theme that has been endlessly recycled, from ‘A Good Year’ to ‘Doc Hollywood’. Catherine Keener and Lisa Blount are lumbered with stock ‘hillbilly simpleton’ roles as the bizarrely names Floatie and Purlene and appear merely to initiate the sort of contrived subplot that is the stock-in-trade of cloying romantic comedy. There is a strange schizophrenia at play throughout ‘Box of Moon Light’, simultaneously mocking and romanticising the inhabitants of the town and the values they typify. The film presents an array of ‘local colour’ – inept local law enforcement, smutty waitresses, belligerent hicks, religious zealots – and urges us to laugh at their simplicity, yet it is also smothered in the usual supercilious ‘they’re stupid but happy’ platitudes. In the end, of course, lessons have been learned, everyone is a better person with a new perspective, all is right with the world, balance is restored and demons are exorcized. All kinds of heavy-handed symbolism and soppy morals are conjured up to try and convince us that the film has said something important about the human condition; though it remains unclear exactly what, beyond the belief that adultery is good for the soul and any spiritual crisis can be remedied by getting naked, dancing and sleeping outdoors. It’s never a good sign when a film opens with a song as generic as the Dandy Warhol’s Rolling-Stones-karaoke hit ‘Bohemian Like You’. Five years after the ‘Double Whammy’ fiasco, Dicillo returned with his latest ‘offbeat drama’, which again struggled to find an audience. 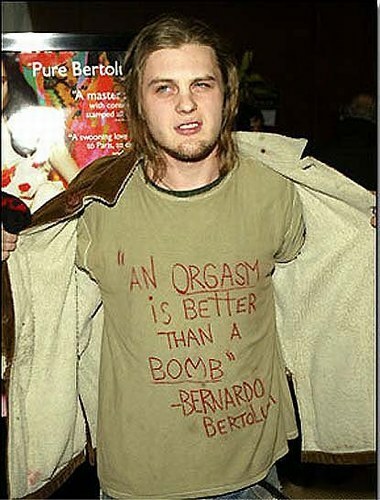 Micheal Pitt – who was trying to erase the memory of his own career lowlight, the woeful ‘Last Days’- plays Toby, a homeless aspiring actor. In his daily wanderings, Toby happens upon a media scrum outside a nightclub, where a gaggle of paparazzo is waiting for the emergence of pop star K’Harma (Alison Lohman). One such paparazzi is Les (Steve Buscemi), whom Toby latches onto and ends up working under in exchange for shelter in Les’s shabby apartment. Les and Toby manage to finagle their way into a succession of benefits and ceremonies, where Toby’s scruffy charm casts its spell on influential casting agent Dana (Gina Gershon) and, inevitably, K’Harma. Toby is thrown into the media spotlight, causing a rift in his relationship with Les. The grainy, under-lit aesthetic and hand-held camerawork befits the down-at-heel scenarios in the film’s early scenes, but as its tone softens and it becomes little more than a romantic fantasy it soon becomes incongruous. Buscemi and Pitt are an effective pairing as the vainglorious, deluded bottom feeder and the callow, wistful bleary-eyed cherub; but one cannot shake the feeling that both are on autopilot here; replaying lesser version of roles they have performed countless times. Lohman is plausible as the put-upon pop commodity, bringing a vulnerability to the role that elevates it beyond the Britney parody it plainly is. Equally, Gershion does more with the slime-ball casting agent role than should have been possible. Elvis Costello makes an amusing cameo, sending himself up as a pompous, volatile prima donna; I’m not sure how much of a stretch that was for him. ‘Delirious’ picks easy targets to lampoon, but even these are handled with maddening ambiguity. DiCillo seems conflicted, or he simply didn’t have the moxie to bite the hand that feeds; on the one hand decrying the moral bankruptcy of the entertainment industry, while on the other revelling in its tawdry glamour. ‘Delirious’ descends into little more than a run-of-the-mill Cinderella story; dressed up with lightweight social commentary, Hollywood insider ‘dirt’, reflexivity and post-modern playfulness. The message seems to be that these radiant public constructs are what we little people should aspire to be; that fame’s warm embrace will heal all scars. More syrupy confection than savage expose, this is DiCillo’s last dramatic feature to date. Lessons have been learned, everyone is a better person with a new perspective, all is right with the world, balance is restored, demons are exorcized and so on and so forth. Pitt provided his own wardrobe for the role of a homeless man.